Scoutmaster/Assistant Scout Master (SM/ASM) (Part 2) May 02 | 7:00 p.m.
Update Your Individual and Unit Scouting records ASAP! Let the District know what you have accomplished as a leader by downloading and filling out a Scouting Resume for registered adults. When completed send resume and supporting documents scanned into a PDF to Nils Erickson at nils.erickson@us.army.mil. These documents will then be QC’d and submitted to the HOAC Service Center Representative to upload into the Council Databases for the individual Scouter’s record and the Unit’s Trained Status. Most BSA training courses do not require recertification with the obvious exception for Youth Protection Training (YPT) which is required every two years. Some courses can be required to be re-trained by Course and Camp Directors at their discretion at anytime for the safety of security of the Scouts and Scouters attending. Please be sure to consult Course and Camp Directors and or District Executives to ensure your unit has taken the requisite classes before any trip, trek or Unit high adventure outing. On-Line Training Opportunities Anytime (Also Called Supplemental Training) - with your BSA ID number (from your membership card, or see your unit leaders), log into the e-learning website, take these on-line courses. 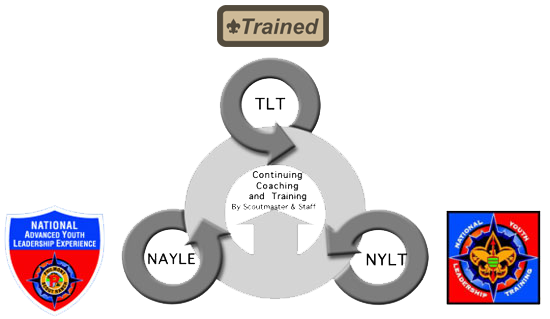 Your successful completion of these courses goes directly into your BSA Scoutnet records. If you have leaders who do not have access to the internet; these courses can be conducted in a classroom setting by a unit or an individual. Email the District Training Chair, Nils Erickson, for more information. A COPE Course is a custom built challenge course or ropes course designed to meet the Boy Scouts of America (BSA) Project C.O.P.E. installation and operation procedures. COPE Programs are based on attaining seven goals outlined by the Boy Scouts of America (BSA). Teamwork is the key that allows a group to navigate a C.O.P.E. challenge course successfully. The C.O.P.E. challenge ropes course experience makes it clear that each individual can accomplish more as a member of a team than by going it alone. A C.O.P.E. challenge course encourage in the moment active learning of critical listening and discussion skills important for any group, troop or individual attempting to accomplish a difficult task. Participants completing difficult tasks on a C.O.P.E. challenge course develop trust in the C.O.P.E. staff members, their fellow troop members and themselves. Team members attempting to solve problems on a cope course have abundant opportunities to develop and exercise leadership skills in small and large groups. Project C.O.P.E. requires groups and troops to make decisions by developing one or more solutions to a the specific obstacle, problem, or initiative. Teams must consider all the available resources and alternatives, and evaluate the probable results before moving forward. Project C.O.P.E. challenges groups and individual to develop solutions to interesting problems. Participants must step outside of the box and frequently use creative ideas. Participants can then test their solutions and evaluate the results. Meeting the challenges of a C.O.P.E. challenge course allows individuals and groups to develop self-esteem and encourages them to set challenging yet attainable goals. Cope course programming on a challenge course, rope course or team course emphasizes learning by doing. When we work with scouting associations, scout troops, scout camps, scouts and scouters on the design, installation, inspection and training of C.O.P.E. challenge courses, ropes courses and/or climbing towers we emphasize the need for a design that will accommodate all ages, sizes, shapes, and physical abilities. Our C.O.P.E challenge course options include innovative initiative elements, climbing towers vertical climbing elements and low and high ropes course challenges.